The revolutionary Danfoss Turbocor is a proven family of compressors that have facilitated the convergence of proven magnetic bearing, variable speed centrifugal compression and digital electronic technologies. As such these compressors achieve the highest compressor efficiencies when applied to water-cooled and air cooled Heating, Ventilating and Air Conditioning (HVAC) applications. Outstanding energy efficiency :- HVAC original equipment manufactures' (OEM's) exceed ASHRAE 90.1 & California Title 24 energy efficiency requirements. Totally oil-free operation : - No oil management controls or line components (improved heat transfer efficiency), i.e. oil separator, oil heater, oil cooler, oil pump, oil filter etc. Extended equipment life and minimal scheduled maintenance :- Solid-state electronics, no lubrication and no metal-to-metal contact of rotating components. Onboard digital controls and power electronics : - Facilitates effective monitoring, control and self-diagnosis (+ correction). Soft Starting:- The soft start module is standard on each Danfoss Turbocor compressor. Soft starting the compressor reduces the in-rush current on start-up and provides advantages to line power systems and reduces thermal stress on the stator. 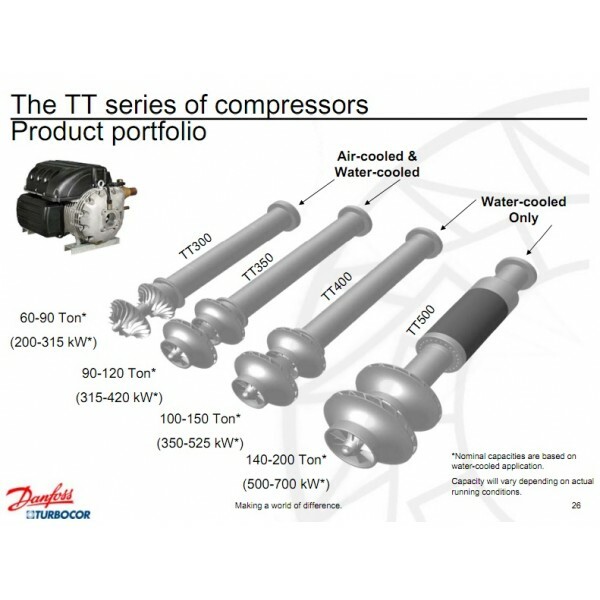 As a consequence, the in-rush current of the Danfoss Turbocor compressors is only 2 Amps verses a typical up to 500-600 Amps empirically by traditional screw compressors in this tonnage range. Magnetic Bearings:- Two radial and one axial magnetic bearings are employed to levitate the rotor shafts & impellors during rotation and thus they float on a magnetic cushion. Compact:- 50% less footprint and 1/4 to 1/5 the weight of traditional compressors. The actual weight is up to 300 pounds, conversely conventional screw compressors weigh around 1000 pounds. Exceptionally quiet operation:- 70dBA (conversation level) sound with virtually no vibration. The combination of magnetic bearings, two stage centrifugal compression, a variable speed permanent magnet motor, intelligent electronic controls endorse that Danfoss have created a sustainable energy efficient compression solution that is compact, lightweight, quiet, reliable and robust. Consequently, Danfoss' Turbocor innovative technology is redefining the lifecycle operating costs for mid-range chiller and roof top applications. It's not surprising that Danfoss Turbocor compressors are transforming the commercial HVAC market.